What are the different types – and speeds – of EV charging? Figure 2: Typical mode 2 (portable) EVSE as supplied with a Nissan Leaf. Figure 1 below shows the four main modes for EV (Electric Vehicle) charging. With each higher mode number comes greater charging speed options. The main modes in use today are modes 2, 3 and 4. (Note that mode 1 is limited to EV converted internal combustion engine vehicles (i.e. diesel, petrol) and some early mass manufacturer EVs. Otherwise it is not used any more). Mode two describes the use of a power lead that plugs into a power point at one end and a vehicle charging plug on the other end. This lead also incorporates a box that is placed no more than 300mm from the 3 pin plug end. This lead is somewhat glorified with the name ‘EVSE’ (Electric Vehicle Supply Equipment) – but it is really nothing more than a power lead with an automatic on/off function controlled by the car. The on/off function is controlled within the box near the 3 pin plug end, and ensures that the lead is only live when the car is charging. The charger that converts the AC power to DC for battery charging and controls the charging process is built in the car. As soon as the EV is fully charged, the car charger signals this to the control box which then disconnects power between the box and the car. The EVSE control box is by regulation not allowed to be more than 300mm from the power point in order to minimise the permanently live section. This is the reason that mode 2 EVSEs come with a label to not use extension leads with them. As mode two EVSEs are plugged into a power point, they limit the current to a level that most power points can deliver. They do this by telling the car to not charge at a greater rate than the pre-set limit in the control box. (Generally this is around 2.4kW (10A)). In mode 3, the on/off control electronics move into a box mounted on the wall – thereby eliminating any live cabling unless the car is charging. 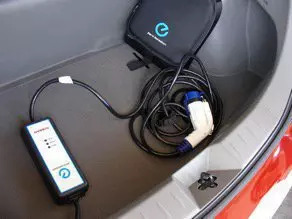 Mode 3 EVSEs are often loosely called a ‘car charger’, however the charger is the same one in the car as used in mode two – the wall box is nothing more than the home of the on/off electronics. In effect, mode 3 EVSEs are nothing more than a glorified automatic power point! What the household supply is capable of delivering – based on what is already connected to the switchboard. (Most houses are limited to 15kW in total. Subtract the household usage and you get what is left to charge the EV with. In generally, an average (single phase) house has the options of installing a 3.6kW or 7kW EVSE). Whether you are lucky enough to have a three phase electrical connection. Three phase connections offer the options of installing 11, 20 or even 40kW EVSEs. (Again, the choice is limited by what the switchboard can handle and what is already connected). Mode 4 is often referred to as ‘DC fast-charge’, or just ‘fast-charge’. However, given the widely varying charging rates for mode 4 – (currently starting with portable 5kW units through to 50kW and 150kW, plus the soon to be rolled out 350 and 400kW standards) – there is ‘some’ confusion as to what fast-charge really means. For further information on Mode 4, see the FAQ on What is DC fast charging?